Are you looking for outdoor science installations? Or would you like to give explanation about existing outdoor installations in a fun way? Eduplaying produces interactive science installations for outdoors. All our installations are 'human powered'; the user generates electricity himself, no need for external electricity! How do you create an inspiring educational outdoor science environment? Imagine your visitors playing in and on a Planetarium! Look at your science center. Most centers create interesting environments indoors to stimulate the visitors. Kids get inspired by models of atoms, solar system simulators etc. But how do you create an inspiring outdoor science environment? How do you inspire kids to explore and play with physics, astronomy or electrics outdoors? 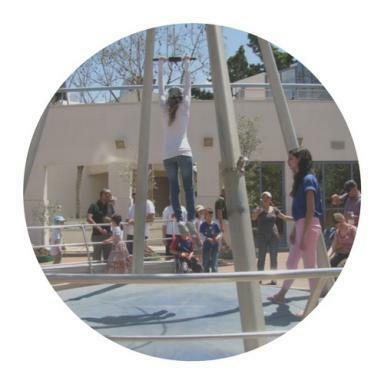 Imagine a playground with interesting, interactive installations which stimulate kids to explore, play and learn! 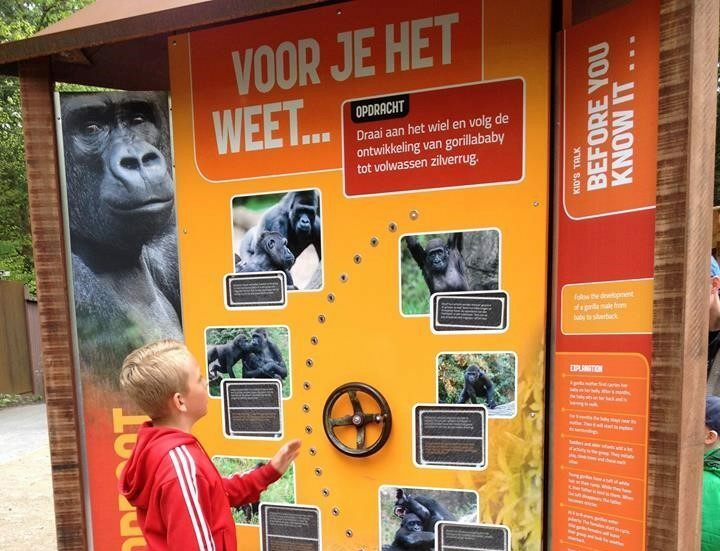 Interactive science installations turn your location into a fun learning environment! Eduplaying’s installations speak the language of today’s kids: interactivity. Using games, sounds, light and buttons our installations engage kids in exciting play. Eduplaying’s installations engage kids in science education while playing. Eduplaying specializes in the development of innovative solutions for outdoor playing and learning. We offer products that are interactive, durable, engaging and ecological. Eduplaying has a clear vision on playing, learning and science education. In order to continuously shape our thoughts we constantly study independent research, set up research projects ourself and partner with leading experts and university partners in a variety of best practice fields. Our products have proven themselves for over ten years in many schools, science centers and playgrounds all over the world! Use our ready-to-go science content packages or create your own content! The audio content of the interactive science installations is either prerecorded, provided by Eduplaying, or produced by yourself! Changing and creating content is very easy. To change the content all it takes is changing the USB stick (disc-on-key) in the installation. To create audio content, any plain MP3 audio file does the job! The interactive Cube is a true landmark, to be seen from far. When spinned, the Cube generates enough electricity to play endless exciting games, for all ages. The Planetarium is a multifunctional installation: from inside children can learn about the stars and the galaxy and from outside it is a magnificent climber. Choose from our large collection of Optical Illusion Panels. People of all ages are fascinated by optical illusions. The strong UV resistant panels will last forever. The Magic Swing demonstrates the coupled pendulums principle, where the swinging visitor is coupled to a large weight. People want to experience it over and over! The iYoyo is an impressive, challenging, fun vertical swing. It is designed as a giant Yo-Yo where the person does the moving. Can be installed indoors or outdoors. The Audionetic Pole, with thousands of installations worldwide. Use our pre recorded science content or create your own stories. This interactive game column provides endless fun. Bring your own energy first by pumping the pedal, then choose from four different games. Can you do better? The Talking Trash Can has an educational role when it comes to younger children to dispose of their rubbish properly, and they’re such fun! The AudioSense can be mounted on any wall. It does not only play excellent audio and tells interesting stories, but it has an option to produce a smell of your choice as well! The Electra Lab is essentially one of these 'Electronic Snap Circuits' kits children experiment with at home, but then in a much larger version and meant for outdoors! The StoryBall is great for kids. Use our pre recorded science content or create your own stories. The StoryBall is easily accessible for kids in wheelchairs and excellent audio quality. The Whisper Catcher enables people to communicate by whispering to each other from far apart. Kids learn about the wonders of sound waves while playing. The Urban Spin offers many exciting educational games. In combination with the interactive tiles the Urban Spin offers the perfect combination of playing and learning! We can realise interactive science installations according to your own design, using our modular system of interactive components. There is more possible than you think! 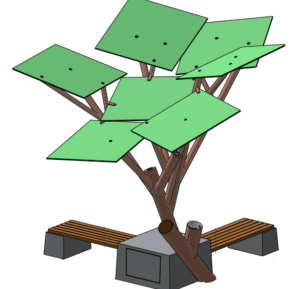 The Solar Tree is a life-size iconic sculpture, autonomously powered by solar panels and offers a wide variety of social services. Working, studying, or just relaxing, it can all be done on this modern bench that features both wireless chargers and USB ports. It is very easy to create your own audio content and to insert it in the﻿ ﻿﻿Interactive science installations﻿. It takes less than a minute! All Eduplaying products make use of human powered energy. The installations don't need external electricity and don't use batteries. Our products products are 100% safe. All Eduplaying installations are tested and certified for the public space. The Eduplaying products need very low maintenance. Some installations are even maintenance free! We use very strong materials in order to ensure top quality. The Eduplaying products are highly vandalism resistant. Located south of the Texas Medical Center, Meridiana is a brand new community with residential and commercial development and three on-site schools. Within Meridiana parks have been developed, both for the use of the community and at the same time catering the local schools according to their curriculum. Around the local water retention basins a trail of learning loops has been realized. Within the first phase three learning labs are being developed; the Astronomy Lab, the Lake Habitat and the Force/Motion/Energy Lab. Eduplaying is honored to be part of the Meridiana project and supplied the Play Planetarium and the Whisper Catchers for the Astronomy Lab. The Dubai Electricity and Water Authority (DEWA) is developing a serie of educational, ecological playgrounds. These playgrounds are interactive and 100% ecological; all electricity is human powered. Eduplaying supplied its partner Gebal co Group with the human powered RunTime installation. The RunTime is not just one game, it's a stimulation to make up your own games. Possibilities are endless! The Ramat Hanadiv park in Israel was looking for a way to tell visitors the story of the new Ecological Butterfly Garden. The challenge was to find a creative solution to engage both kids and adults with the story in an engaging way. Eduplaying supplied an Audionetic human powered audio player and designed an exciting story with an imaginary dialogue between a little girl and a butterfly. Eduplaying wrote the script and produced professional audio content including effects in English and Hebrew. The Audionetic changes the whole atmosphere of the Butterfly Garden! Naf Hershler and Miriam Levy are leading Eduplaying's team of playground designers, creative consultants and science education experts. Naf has a background in technology and eLearning and is an expert in storytelling and science education. Miriam worked for many years in community building and has extensive experience in marketing-communication. The management of Eduplaying is operating from it's main office in Amsterdam, the Netherlands. The easiest way to contact us is by sending an email. Fill in this form and we will contact you as soon as possible.